– James F. Taulman, former Editor-in-Chief of the first independently licensed website to offer stock reports and services based on the CAN SLIM® investment system. NOTE: Today’s watch list can be found here. Yesterday, the Dow Jones closed -0.3% lower on Tuesday, while the S&P 500 was off -0.1%. The Nasdaq gained +0.2%. This morning, U.S. stock futures are higher. European markets dropped in early trading, while stocks in Asia closed mostly up. The U.S. Federal Reserve is expected to raise its benchmark interest rate by a quarter of a percentage point for the third time this year, to a range of 2% to 2.25%. If it happens, it will be the eighth hike since late 2015. Four more moves before the end of 2019 may be in the cards. Fed Chairman Jerome Powell will hold a news conference after the decision is issued at 2:00 p.m. ET. Early each market morning James diligently screens through hundreds of high EPS and RS ranked stocks that have solid fundamentals. He is looking for those select few which are setting up in sound technical bases and which looked poised to breakout that day. Each stock is listed with specific trading criteria such as a TRIGGER PRICE, TRIGGER VOLUME and MAX BUY PRICE. Just $9 a month through James’ BuyingBreakOuts.com website. 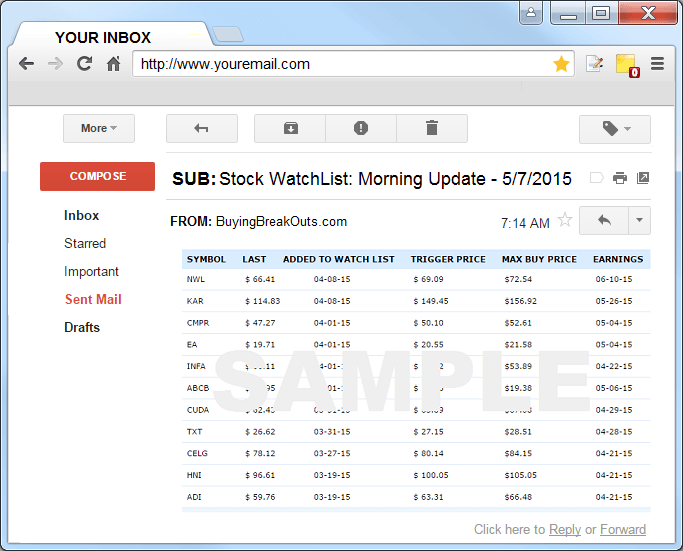 I ran my routine stock screens early this morning, yet did not find any new stocks to add our watch list. 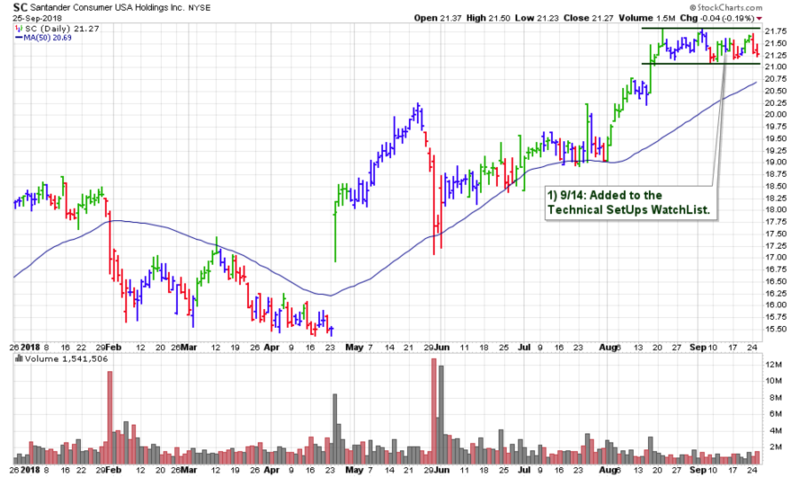 We still have 10 stocks which we will be watching for the next buyable breakout – see here. One stock in particular is SC. This consumer loans provider is building a tight base near new highs and just above its 50-day moving average. Standard rules apply – any gains above the stock’s TRIGGER PRICE while the day’s volume is at least on pace to make the TRIGGER VOLUME would have any of these set ups confirming a BUY signal up to their MAX BUY PRICE by default. Keep in mind that when a stock breaks out – becomes potentially buyable – there are other factors to consider. Volume on the breakout. A stock that is breaking out through resistance, with an increase in volume of +50% above the stock’s average volume (50 DAV), is showing more conviction and more demand. This is not saying – all lower volume breakouts will fail. Actually, we’ve seen many continue higher. If you have found that you did buy a stock that showed lower daily volume or volume under 50%, going forward – simply treat it a regular trade. Earnings BreakOuts. Many stocks from our watch list will break out during earnings season. Earnings breakouts can be more rewarding, however, these trades carry much more risk then traditional (non-news) breakouts. One needs to also consider – the strength/weakness of the fundamental news that was just released along with the forward-looking guidance the company gave, investors response to the conference call, etc. For anyone who is not familiar with – buying earnings breakouts – I suggest that they sit through a few seasons to study, paper trade, and show some profits, before applying actual capital. About the Founder: James F. Taulman – James served as Editor-in-Chief of the first independently licensed website that offered stock reports and services based on the CAN SLIM® investment system. He has developed a knack for being able to quickly and accurately analyze high-ranked stocks based on this winning investment strategy. Over the years, Mr. Taulman has enjoyed assisting individuals from professional money managers to private investors with their needs in relation to implementing this investment approach on a daily basis in the current marketplace. Each Sunday you could hear him deliver his weekly market report as part of the “Your Money Matters” radio program on ABC and CBS radio networks. _________________________________________________ Disclaimer: James Taulman is not an investment advisory service, nor a registered investment advisor or broker-dealer and does not purport to tell or suggest which securities or currencies customers should buy or sell for themselves. The independent contractors and employees or affiliates of Company may hold positions in the stocks, currencies or industries discussed here. You understand and acknowledge that there is a very high degree of risk involved in trading securities and/or currencies. The Company, the authors, the publisher, and all affiliates of Company assume no responsibility or liability for your trading and investment results. Factual statements on the Company’s website, or in its publications, are made as of the date stated and are subject to change without notice. It should not be assumed that the methods, techniques, or indicators presented in these products will be profitable or that they will not result in losses. Past results of any individual trader or trading system published by Company are not indicative of future returns by that trader or system and are not indicative of future returns which be realized by you. In addition, the indicators, strategies, columns, articles and all other features of Company’s products (collectively, the “Information”) are provided for informational and educational purposes only and should not be construed as investment advice.